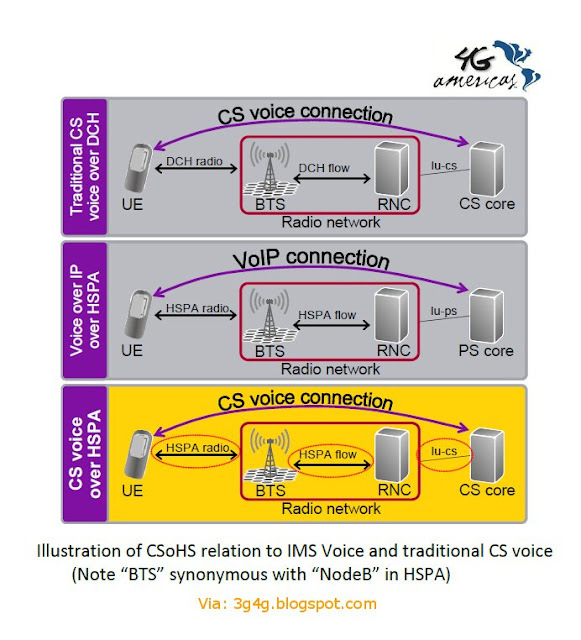 4G Americas has recently released a whitepaper entitled, "Delivering voice over HSPA". This paper describes the technological features that are being developed to make Voice over HSPA (VoHSPA) a reality. It describes the two potential options for VoHSPA. The first option leverages IP Multimedia Subsystem (IMS) technology developed in conjunction with Long Term Evolution (LTE), and is referred to as IMS Voice over HSPA or simply IMS Voice. 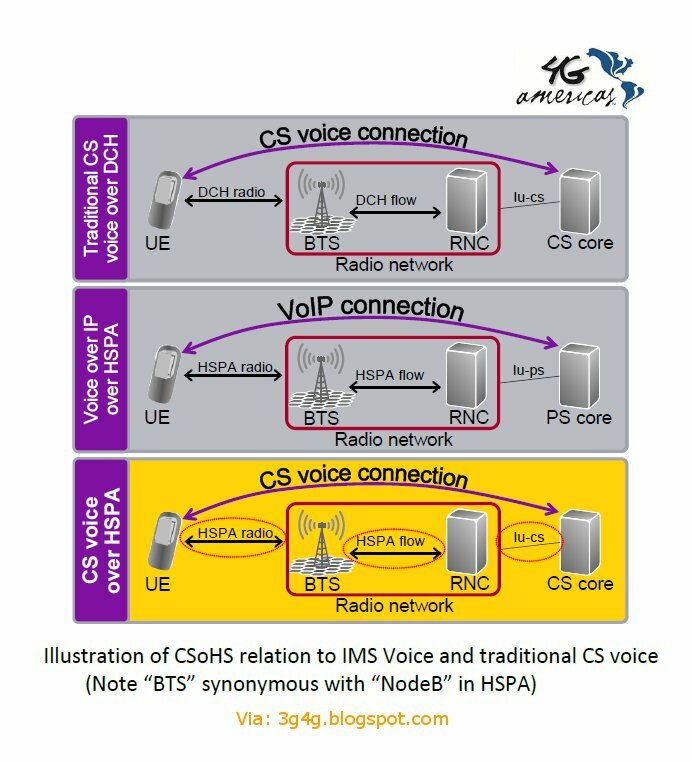 The other option delivers voice by modifying existing circuit-switch based techniques so that those communications can be transmitted over an HSPA infrastructure, and is referred to as CS Voice over HSPA (CSoHS). Both the options are shown in the picture above. Note that there is no discussion about Over the top (OTT) type voice services like Skype, etc. The chief among benefits anticipated from VoHSPA are increases in the spectral efficiency of mobile networks. With these new techniques, voice calls can be delivered more efficiently from a spectral standpoint over Packet Switched (PS) rather than Circuit Switched (CS) networks freeing up radio resources for additional data traffic. 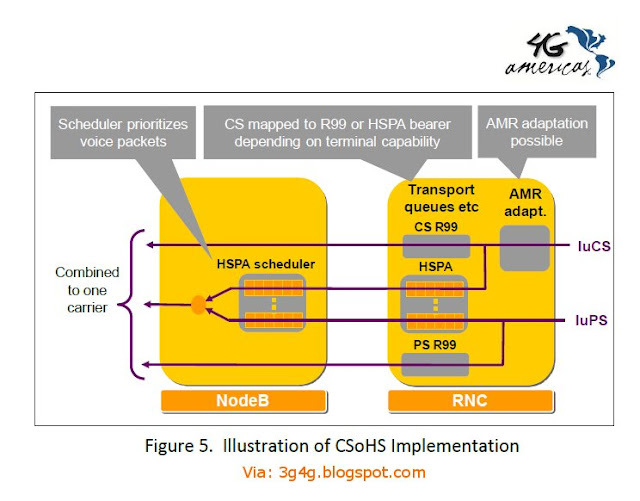 The 4G Americas report defines work completed by the GSMA for a minimum mandatory set of features defined in existing 3GPP Release 8 specifications (IR 58: IMS Profile for VoHSPA) that should be implemented in order to insure an interoperable, high quality, IMS-based telephony service over an HSPA radio access layer. In the white paper, 4G Americas recommends additional features, above the minimum mandatory features in IR 58, for VoHSPA either under an IMS or a CS approach, in order to minimize packet losses and variations in packet arrival times that can impair the quality of voice communications. The whitepaper is available to download from here. RAN priorities during beyond Release 11 from 3GPPlive on Vimeo. 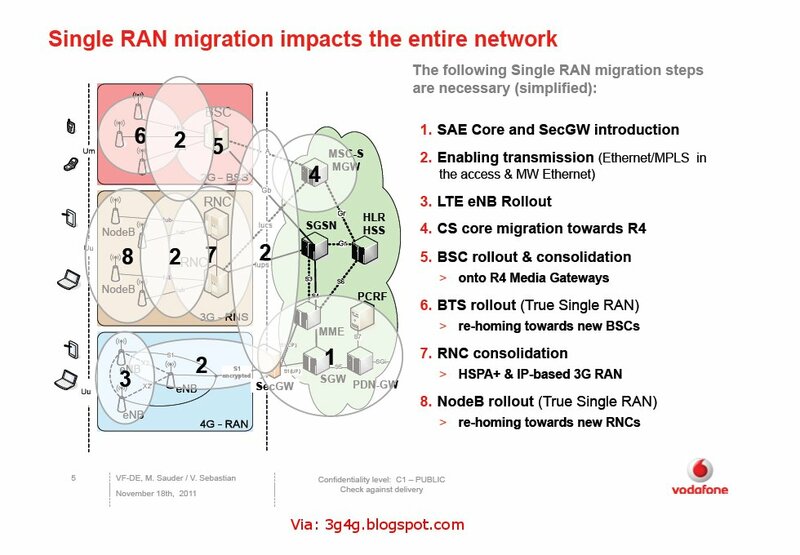 An interview with Takehiro Nakamura, 3GPP RAN Chairman, filmed December 2011. -How does LTE-Advanced change things ? 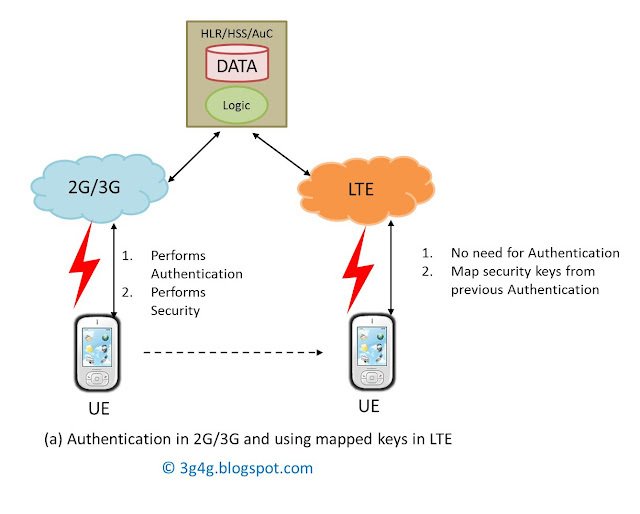 When a UE registers on a network in 2G/3G or LTE, it has to perform Authentication. The Authentication Vectors are located in the USIM for the device and in Authentication Center (AuC) in the network. Once the Authentication is performed successfully, then the Keys for Ciphering and Integrity are derived and used during the call. 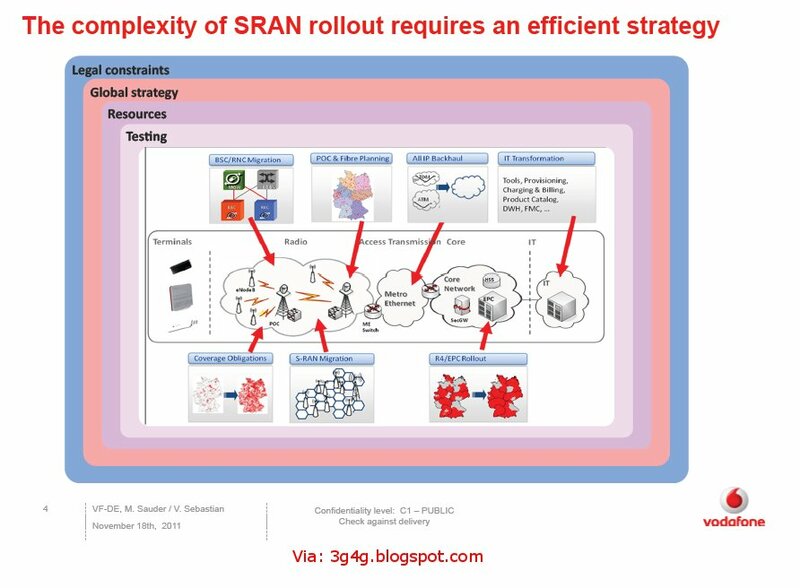 As I showed in my earlier post here, It is possible that the same AuC is used for 2G/3G and LTE networks. 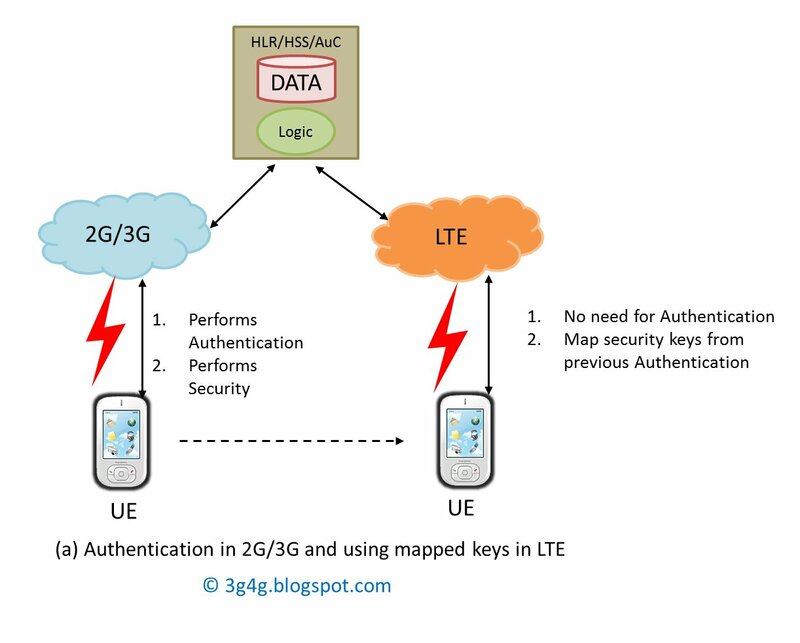 In this case if the UE has recently performed Authentication in one network then unless the keys are old, there is no need to perform the Authentication again in the other radio access technology (RAT). The Security keys (Ciphering and Integrity key) would be derived based on the keys in the previous RAT. 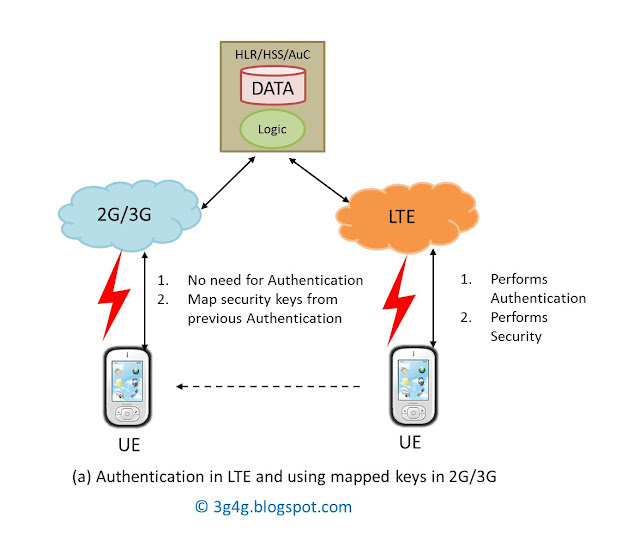 3GPP TS 33.102 and 3GPP TS 33.401 gives the details on how to derive the key from the previous RAT while in the new RAT using this mapped security concept. In 2010, 6.9 trillion text messages were sent globally and this figure is expected to break the eight trillion mark in 2011. This represents USD 127 billion in revenue for operators. LTE provides the same basic SMS features, such as concatenated SMS, delivery notification and configuration. However, the SMS delivery mechanism is somewhat different. A VoLTE device can send and receive text messages encapsulated within a SIP message. To receive a text message, the encapsulation process is invoked by an IP short-message-gateway in the IMS domain, and the gateway converts traditional Signaling System Number 7 (SS7) Mobile Application Part (MAP) signaling to IP/SIP. To ensure that text messages are routed via the gateway, the home location register (HLR) of the recipient needs an additional function to return a routable gateway address back to the SMS-C on receipt of an SMS-routing request. 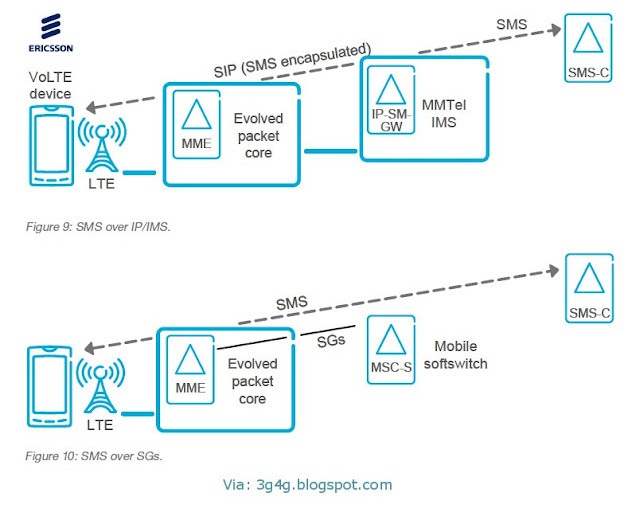 When a VoLTE device sends a text message, it should perform the encapsulation. The gateway extracts the text message inside a SIP MESSAGE signal before passing it on to the SMS-C. However, if the VoLTE device is configured to not invoke SMS over IP networks, text messages can be sent and received over LTE without the need for any SIP encapsulation. A received text message will reach the mobile switching center server (MSC-S) of the mobile softswitch system in the same way as it does today. The MSC-S will page the device via the SGs interface with the Mobile Management Entity (MME) of the EPC system. Once a paging response is received, the MSC-S will pass the SMS on to the MME, which in turn tunnels it onto the device. Due to the support for SMS delivery and IP connectivity provided by LTE/EPC, MMS works seamlessly. For more technically minded people, there is a whitepaper that covers SMS in detail available here. Available to download from here or here. 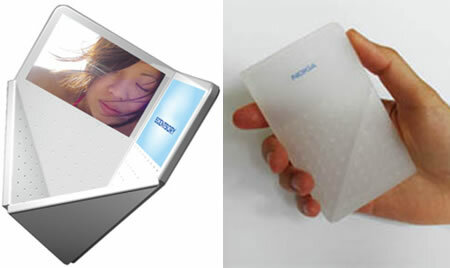 In Japan, they love to re-brand the standard technologies into something more interesting to attract people's attention. In a way they are right as they want to offer a service rather than a technology. Couple of years back NTT Docomo launched its Crossy service, that was offering LTE with upto 75Mbps dl speeds. Yesterday, I read about Softbank launching their 4G service that is based on AXGP format. High-speed data communication service Wireless City Planning of the SOFTBANK Group (Wireless City Planning, WCP) will be scheduled after February 2012, adopted a new communication method AXGP is, in excess of up to 100Mbps downlink high-speed communication is a feature . It was an opportunity to use the test machine prior to the start of service for general users, to report a sense of its use. "AXGP" high-speed data transmission technology WCP employs a technology that was originally planned to use the 2.5GHz band has been assigned from the Ministry of Internal Affairs and Communications Willcom to deploy as "PHS" next generation. Had to expand the limited service area and some intended for users under the name of "WILLCOM CORE XGP" PHS is then the next generation, business is XGP is "Wireless City Planning" of Softbank subsidiary company under the reorganization proceedings of Willcom inheritance. Provide the service as "AXGP" form of communication is an evolved version of XGP in WCP. AXGP, in addition to the XGP also hand while inheriting the "micro cell" was characteristic of PHS, PHS has been developed as the next generation, that have become compatible with the method of TD-LTE. 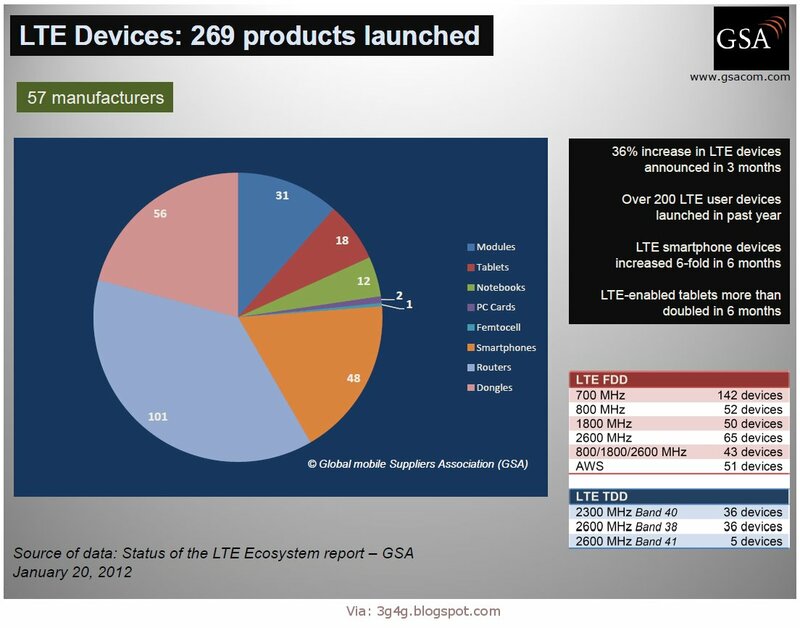 Including China and India, that are compatible with the TD-LTE system is expected to expand in many parts of the world, the benefits can be expected that international expansion is expected. AXGP is at present, but services have been provided for users in a small part had been using the service test XGP Willcom old, since the February 2012 service "SoftBank 4G for general users as MVNO Softbank Mobile plans to start ". The communication speed up to 110Mbps downstream and 15Mbps and maximum upstream and downstream speeds in excess of 100Mbps for speed has become a feature. At the start of service, the mobile router will "101SI" made of (SII) will be released at the same time Seiko Instruments. However, 101SI has become a maximum 76Mbps to 110Mbps falling down is the theoretical value of the service, at the start of the service is not provided in the full spec. Terminal is planned to also provide support AXGP Then, in the year 2012 is also powered smartphone will be compatible with AXGP. 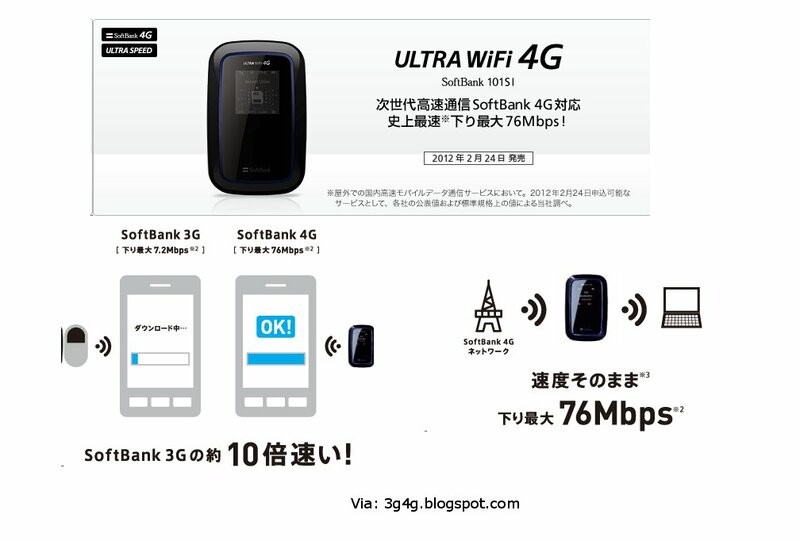 In addition, "101SI" to support (42Mbps maximum downlink, 5.7Mbps uplink maximum) "ULTRASPEED" Softbank mobile. Although a measurement with the outdoor area was limited, with respect to communication speed was very good results with the results fit. Most favorable conditions and even the user does not exist before the start of the service say that already provide services as high-speed data communication, "Xi" of NTT DoCoMo, Inc., or UQ Communications 37.5Mbps, which is the maximum theoretical value of outdoor (Kurosshi~i) It was also a number greater than the maximum 40Mbps "UQ WiMAX" of is very encouraging. 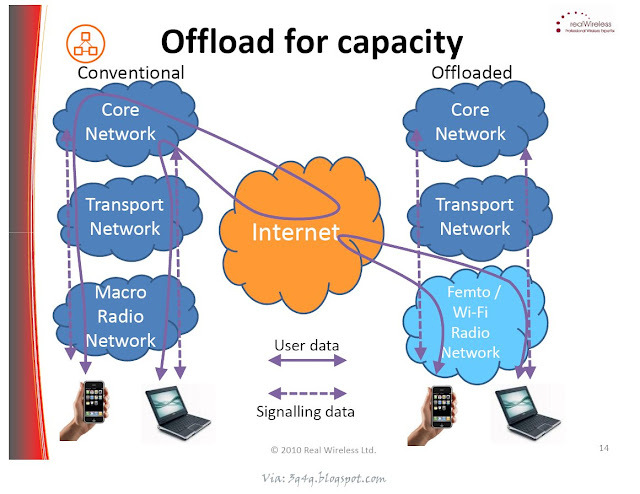 However, the decisive factor in mobile data communications is not only communication speed, three elements of the communication charge is important and easy-to-use, deployment area, including "ease of connection." In the area at the moment of some are very fast and are limited in the Yamanote Line, but is a matter of course in order before the service, ease of connection of the fact there are many parts of the still unknown. Also, I'd be anxious and services are provided in the fee structure what. SoftBank is to introduce a flat-rate voice among their users ahead of any other mobile phone operators so far, campaigns expand the iPhone however any inexpensive flat-rate packet. Further has a track record of just made me started to increase subscribers by the "straight-line with anyone" WILLCOM has also continued to decline in subscribers. Softbank Mobile also be deployed as a MVNO, at the time of release of the service that you want to use the AXGP expect a bold expansion of unique services and Softbank WCP, which is the same group Softbank. 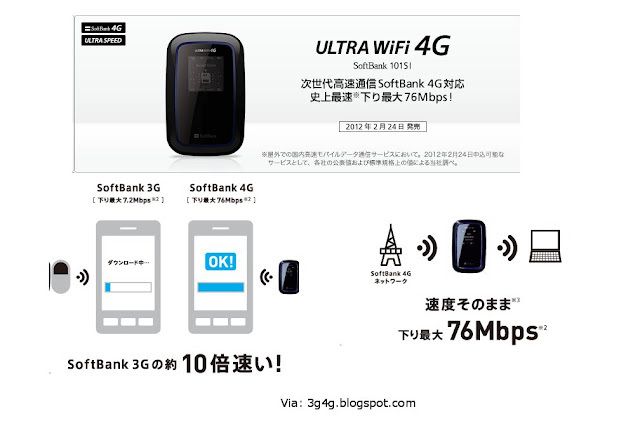 Softbank's website is billing this as 'Ultra Wifi 4G' and will be launched to public this Friday, just in time for MWC12. Nearly a year and half back, I posted a blog about Fast Dormancy here. This issue has surely been fixed in most of the devices and the networks are able to handle the issue even if the handsets have not been fixed. 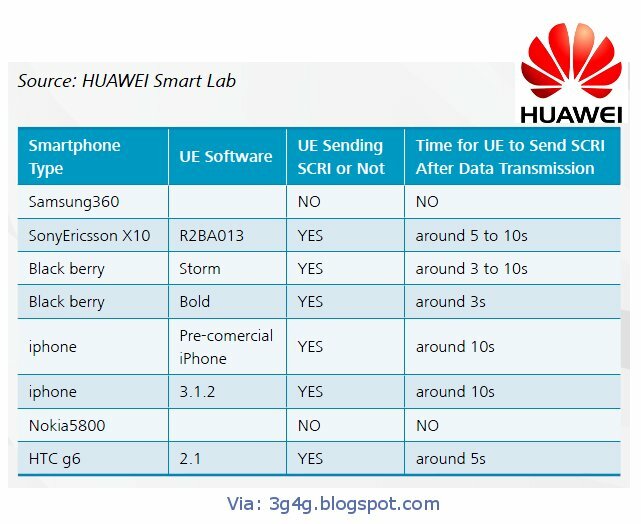 I found an interesting table in a Huawei journal that shows the timings used by different devices that are being reproduced for people who may be interested. @StevenJCrowley: Exhibit 1: In last year's VNI, Cisco estimated that in 2014, 23% of US mobile data would be offloaded. It's close to 50% today. @dmavrakis: it depends how you define offload. Some of this 50% may be simple WiFi access rather than offload. @dmavrakis: So if I buy a SIM-only handset and not even put a SIM in and use WiFi, it's considered offload? @StevenJCrowley: Seems to me that's not considered offload because without a SIM it's not a 2,3,4G capable device. @StevenJCrowley: BTW my old AT&T iPhone 3G won't work as a Wi-Fi-only device without an old inactive SIM still in it. Don't know about iPhone 4. @simonchapman: app downloads (500MB+ for some games), AirPlay etc are much greater than 2/3/4G use. Where is 50% figure from? 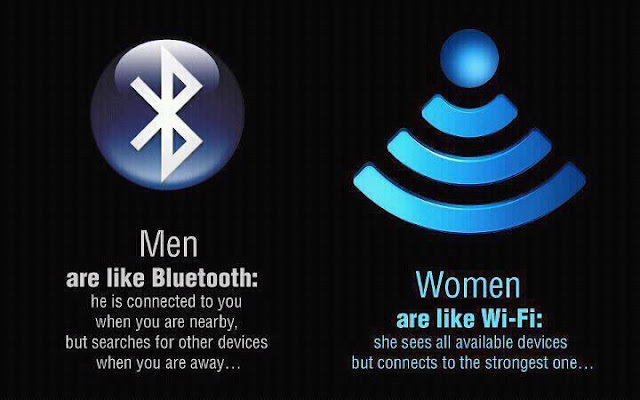 @SteveLightley: the actual presence of decent connectivity encourages higher capacity activity. Is that offload? @dmavrakis: Also core network onload via WLAN gateways without local breakout. @disruptivedean: A thought about "offload". I only "onloaded" to 3G data on my PC in the first place because WiFi wasn't everywhere I needed it. Now it is. @StevenJCrowley: AT&T recently said macrocell data growth down to 40% a year. @StevenJCrowley: I like Dean's chart. Offloading important in U.S. from 4G spectrum requirements issue. @StevenJCrowley: And here spectrum debate is more political than technical, thus broad brushes. @StevenJCrowley: It's basically, "We need spectrum to stream NetFlix." "No, you're inside and can use Wi-Fi." @SteveLightley: looking forward to gabe's view on access etc when he gets here! @StevenJCrowley: AT&T will spin it. "If only we had more spectrum we could have sent more data." Etc. @dmavrakis: Arguably spectrum is the MNO's most valuable possession. Isn't it natural that they want more? 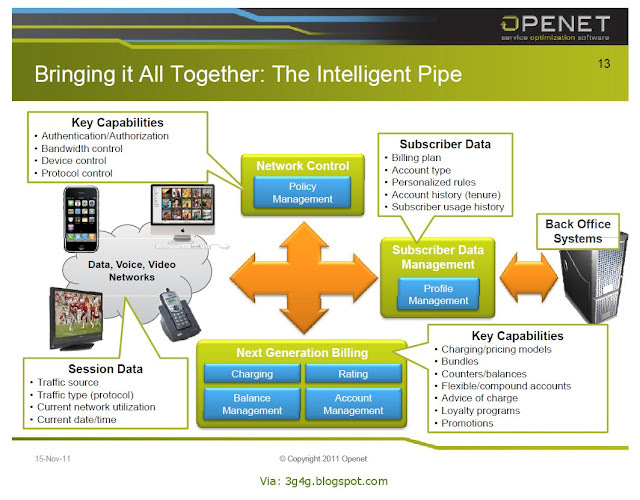 @StevenJCrowley: More spectrum than needed is an idle asset that costs the company money. See also the earlier posts on Policy and Charging here and here.